Sonic the Hedgehog 196 is the 196th issue of the Sonic the Hedgehog comic series, and the final part of the "Invasion from Moebius" story. It was released January 2009. Continuing from the last issue, The Freedom Fighters and the Suppression Squad are seen in the Brain Trust Lab at Freedom HQ arguing over leaving Sonic and Amy (among others) stranded on Moebius with the power-crazed Scourge. Confident that the "Heroes" have been able to stomp Scourge (being unaware of the Anarchy Beryl in the throne), Miles convinces Princess Alicia to venture back to their home with the Freedom Fighters. However, they are shocked to find that King Scourge has beaten down not only Sonic, but also Silver, Shadow, Amy, Metal Sonic, Rob O'The Hedge and Amy's counterpart Rosy. Not surprisingly, Scourge is happy to see the new arrivials, if only to "soften his knuckles" on them. Before they have time to react, he quickly strikes at Bunnie, and then pins Antoine to the floor. When Tails attempts to stop him, Scourge simply swats him away like a fly, calling him a "mutant brat". He then turns his attention on Sally, lifting her up, then proceeding to throw her across the room, taunting her while doing so. He gives her counterpart a similar treatment, tossing her into the throne. Boomer and Patch then attempt to bring him down, but to no avail. Scourge effortlessly deflects Boomer's sonic blasts, whilst being unharmed by Patch's sword (the sword breaking to pieces, in fact). Threatening to blind Patch, he tosses him into Boomer, then turns to Miles, who cowers in fear, having organized the Suppression Squad's mutiny. Before Scourge is capable of harming Miles, Silver uses his psychokinetic abilities to hold Scourge, who easily breaks out of the psychic grip. At that moment, Sonic is contemplating his own weaknesses when in Super form, only to be interrupted by Metal Sonic, who has changed priorities to Sonic due to a success rate of zero against Scourge in his Super form. Before the battle drags on, Shadow breaks up the fight, and uses Chaos Control to teleport himself and Metal Sonic to the Sonic X universe. Scourge, however, has been dealing with Rosy, who is angry that Scourge "isn't squishy anymore". Fed up with her deranged interferance, he throws her into a wall. Rob O'The Hedge takes this oppertunity to use a rope trap arrow to pin Rosy to the wall, to protect his cousin's counterpart. Meanwhile, Sonic is interrogating Miles as to where he can find more Anarchy Beryl, only to learn it is far from the castle. Miles suggests luring Scourge back to Mobius and using the Chaos Emeralds, but as most of them are in the Special Zone, and the other two out of their reach, they cannot. Sally forms a plan to stop Scourge. Having Silver hold him in place and Bunnie and Boomer force him down with their blasters, the whole gang piles on him to hold him down until he powers down. But Scourge proves too powerful for them to keep down. Sonic spindashes at Scourge repeatedly, until the latter drags him out into the rain, throwing him to the ground. Scourge reveals he now plans to spindash both Moebius and Mobius in half, and continue stomping planets until he finds one that would give him the respect he "deserves". In the middle of his monologue, Sonic runs off into the woods, again pondering his Super form's weaknesses. He realizes that he feels great when he goes super, even after powering down. 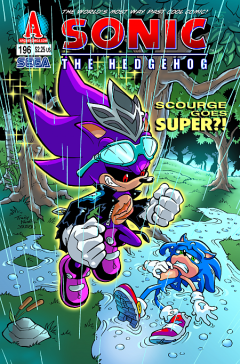 This makes him realize that Scourge, being his opposite, would be drained if he were to power down. Tricking Scourge into powering down by claiming he couldn't beat Sonic in his normal form, he beats Scourge at his own game, explaining that, while the source of power is different, the Super forms are the same, though Scourge's may last a little longer. The difference is that Sonic powers down with a small boost, and Scourge with a debilitating crash. Scourge attempts to stand back up to Sonic, saying he was "cheated", recalling his conquering of Moebius, and calling Sonic "nothing". Sonic responds by angrily shattering Scourge's crown. He tells Scourge he is nothing but a bully that takes the easy way to the quick reward. He goes on to comment on how he helps others to make something bigger and better than just mean. The next day, Boomer can be seen disconneting their stolen globe posts, so that the Freedom Fighters and Buns can return them to their rightful owner, Dr. Kintobor. As they are leaving, Miles and Alicia are left to dicuss their next course of action, including and unspoken agreement that Miles will soon be king. At Dr. Kintobor's Tower, Sonic and Silver are working out the problem they had earlier. Silver agrees that Sonic is not the traitor that he was looking for, and says he will be back when he finds out who it is. Inside the tower, Dr. Kintobor thanks Sonic for his help. Sally says that it's all wrapped up, as she and Sonic are the last two to go home. Sonic says that isn't quite the case, as he plans to go to the Parallel Zone, not only to lock up Scourge, but also to get some answers, setting up for the next issue. Recently, the backstory of Issue 201 (Devotion) suggest that Espio may be the aforementioned traitor. This was later confirmed in the main story of Issue 202. The issue's title is a throwback to Issue 161, which was titled "Sonic Goes Super!". However, Scourge had gone super in the previous issue. This issue has no asterisks referencing a previous issue.